The Royal Botanical Gardens, located near Burlington, Ontario on the Niagara Escarpment around the western tip of Lake Ontario, opened in 1932 and now covers 2,700 acres with some 9,000 different plant species and cultivars displayed in four major garden areas and an arboretum. It also has 18 miles of walking trails, including a Marsh Trail through one of the continent’s largest wetland restoration projects. The Gardens are a popular wedding site. On the Saturday in June when I visited there were at least a half dozen weddings taking place simultaneously in different areas. St. Jean-Port-Joli, located on the St. Lawrence, is known as the wood carving capital of Québec. Wood sculptures are located throughout the town. The church of St. Jean Baptiste, built in 1779, has been classified as a historic monument. On July 3, Québec City will be 399 years old (expect a big birthday bash in 2008!). Most of Vieux Québec, Old Québec, is within the well-preserved fortification walls either built or reconstructed by the British during the 1820s. The city was designated as a UNESCO World Heritage Site in 1985 in recognition for preserving its fortifications. The Citadel, constructed between 1820-52, sits on the Cap Diamant promontory. The Promenade des Governeurs, which starts in Battlefield Park, offers cliff views overlooking the St. Lawrence. It connects with the Dufferin Terrace with spectacular views of Old Lower Town and the St. Lawrence as well as the Château Frontenac. 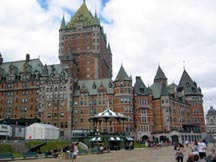 Le Château Frontenac was built in 1893 with numerous turrets and verdigris copper roofs reminiscent of medieval France. The narrow streets of Vieux Québec mix military, religious, and residential buildings along with boutiques and restaurants. My favorite streets were Saint Jean and Saint Louis. Just outside the Vieux Québec on Grand Allee are the Parliament Buildings. The main building, constructed in French Renaissance style, has niches in the façade containing statues of historical figures. The Botanical Garden of Montreal, Jardin botanique de Montreal, is a wonderful place to nourish the soul. The botanist Frere Marie-Victorin founded this garden in 1931. It covers some 180 acres and contains more than 22,000 varieties of plants within 30 gardens, 10 exhibition greenhouses and a 96 acre arboretum. A sign in the reception centre Place Marie-Victorin is worthy of reflection: Plants are not simply a pretty green setting for animal life. They are living, breathing organisms that absorb and transpire, reproduce and defend themselves. Plants perform their vital functions through continual interaction with the living and the non-living. The smells in the Orchid Greenhouse were exhilarating; the sounds of the waterfalls in the Fern Greenhouse soothing. 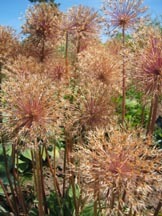 Most of my pictures were taken in the Greenhouses and the Perennial Garden. It was easy to establish a mediatative state in both the Chinese and Japanese Gardens. The Montreal Insectarium, however, was filled with school children (school isn’t out until June 28 ) whose incessant chattering disrupted my quiet state. 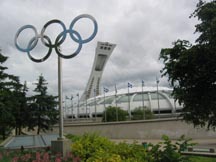 A major highlight of the day was a trip atop the 575 foot Montreal Tower located in the Olympic Park complex. The observatory at the top of the tower offers incredible views of Montreal. Fredericton, named for the second son of King George III by loyalists fleeing the American Revolution, was made the provincial capital of New Brunswick in 1785. Evidence of its rich history and old architecture impressed me when I drove through seeking a bank to exchange money. Scenic north-south roadways follow the Saint John River. Woodstock is a major border-crossing point with the United States and the oldest incorporated town in New Brunswick. The Saint John River is nestled between pastoral hillsides. 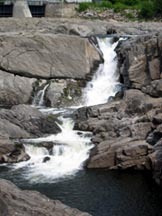 As the name suggests, Grand Falls is the site of Grand Falls, a horseshoe falls on the Saint John River. 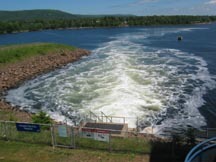 A hydroelectric plant dominates the view of the Falls, but undoubtedly benefits the province of New Brunswick. The huge rocks throughout the gorge offer dramatic views from the adjacent trail. Kejimkujik National Park, located in the southwestern region of Nova Scotia on the way to the Bay of Fundy, has a mixture of hardwoods and conifers that cover low oval-shaped hills carved by glaciers. The Beech Cove Trail provides a good introduction to the flora and fauna of the park. Beavers have been active and left their teeth marks on many stumps. The rushing Mill Falls water is brown from tannic acid. Good hiking follows the meandering Mersey River through old hemlock trees and dense growths of balsam firs by Jakes Landing with a view of Kejimkujik Lake from a viewing tower and ends at Merrymakedge Beach. Much of Keji has rolling hills or drumlins which are typically shaped like the inverted bowl of a spoon with its widest and highest end pointing in the direction from which a glacier came and formed it. Be aware of the warning signs posted on some of the roads for the endangered Blanding turtle. The Port Royal National Historic Site of Canada dates back to 1604 when Samuel de Champlain named the harbor. The Port Royal Habitation was rebuilt using Champlain’s plan and studies of early 17th century French architecture. The buildings include a governor’s residence, gentleman’s quarters, chapel, guardroom, kitchen, bakery, blacksmith shop, living quarters, and artisan’s workshop, and a common room. It established North America’s first recorded social club, Order of the Good Time in 1606. During my stay in Nova Scotia, I was duly inducted into this historic order! Annapolis Royal has many interesting sites. The Annapolis Royal Historic Gardens is a 17 acre park with themed gardens representing different periods in Annapolis Royal’s history. The Acadian section includes a replicated 1671 thatched-roof house. The Fort Anne National Historic Site of Canada was the site of forts built by both the French and British for maintaining control of eastern Canada. Fort Anne was Nova Scotia’s capital until 1749. The Annapolis Tidal Generating Station opened in August 1984 and is the only tidal power plant in North America. According to an informative brochure published by Nova Scotia Power, it generates more than 30 million kilowatt-hours per year, enough electricity to power 4,500 homes. The Grand Pre National Historic Site commemorates the town’s Acadian settlers who were deported 1755-63. A multimedia theater recreates the difficult conditions of the Acadian expulsion. 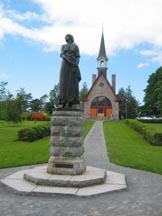 This area inspired Henry Wadsworth Longfellow’s epic poem, “Evangeline.” A statue of Evangeline and a memorial church evoke the enduring attachment of Acadians to their ancestral homeland. The following poignant statement is taken from a sign in the Interpretation Centre: All too often in times of conflict, civilians are the victims. The K. C. Irving (namesake of Canadian gas station fame) Environmental Science Centre and Harriet Irving Botanical Gardens are located on the campus of Acadia University in Wolfville. The 6 acre botanical gardens contain nine habitats from the Acadian Forest Region. The Science Centre features state of the art greenhouses, a conservatory, and botanical laboratories. Near Wolfville is the 35 acre Gaspareau Vineyards. Check out their ice wine. Hall’s Harbour Lobster Pound is a good place for dinner, if you like lobster. 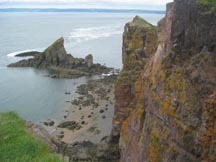 At the tip of the Blomidon Peninsula is Cape Split, beyond the Look-Off to Scots Bay. It’s a great hike through wilderness with sweeping views from the cliff top at the end of the trail. The world’s highest tides rise in the Bay of Fundy, some more than 50 feet. The tides work on roughly a six-hour cycle, and each peak arrives 50 minutes later each day. Awesome! In 1995 UNESCO designated Lunenburg as a World Heritage Site, one of only two cities in North America so honored (the other is Quebec City). It is considered an excellent example of a planned British colonial settlement. The town was laid out in a rectangular grid with narrow streets and garden plots. The protestant German, Swiss, and French immigrants recruited by the British to settle the town in 1753 quickly discovered that this site was not conducive to agriculture and they adapted to embrace fishing and shipbuilding. Their influence is apparent in the town’s architectural details. St. John’s Anglican Church, established in 1754, was destroyed by fire in 2001 but has now been rebuilt. Lunenburg Academy, dating to 1885, is a distinctive black and white wooden building. Originally a high school, it is now the local elementary school. The informative Fisheries Museum of the Atlantic includes two ships and several waterfront buildings with exhibits on shipbuilding, seafaring, and marine biology. 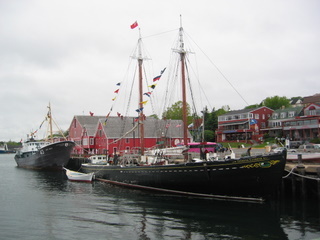 The Bluenose, the undefeated champion of the North Atlantic Fishing Fleet and the winner of four international schooner races from 1921 to 1931, was built in Lunenburg. 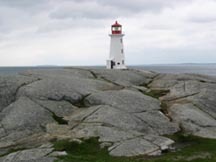 Peggy’s Cove is one of several fishing villages built around the snug harbors of the craggy south coast. Huge granite boulders are scattered throughout the village. An old lighthouse standing on a massive granite ledge and fishing boats moored along weatherworn wharves create an ideal atmosphere for the photographer. On September 2, 1998, Swissair Flight 111 crashed about two miles south, killing all 229 onboard. A well-designed memorial commemorates the site with 111 notched in a granite boulder looking toward the location of the crash. Another quaint seacoast village is Mahone Bay with its art, craft, and antique shops (but don’t forget to check out a grocery store, too) and a picturesque shoreline of stones and boulders. Good hiking awaits those who venture across the rocks of Hartling Bay and through the woods to Gaff Point. For another great outing, take the ferry from Chester to explore Big Tanook Island. Halifax, called Kjipuktak by the Mikmaq, is said to be the world’s second largest natural harbor (35 km long, up to 3.2 km wide, and reached 76 metres in depth). Thus, it is understandable that it has a long military history. The Halifax Citadel, a large star-shaped masonry structure, sits atop a hill just above the harbor. The British went to great lengths to make this fortification impenetrable. There are two walls, one of which is eight feet thick, with a ditch in between and they kept enough supplies to survive a siege of six weeks. The Maritime Museum of the Atlantic tells more of the story. In addition to documenting the Royal Canadian Navy, one can see artifacts from the Titantic. There is a particularly interesting exhibit on the Halifax Explosion. This catastrophic explosion occurred on Thursday, December 6, 1917 when a French ship, the Mont Blanc, filled to the gunwales with explosives was struck by a larger vessel, the Imo. When the Mont Blanc blew at 9:05 a.m., it killed about 2,000 people and wounded another 10,000, many of whom were blinded. At the time this was the largest man-made explosion in history. And, if this devastation wasn’t enough, that night there was a major snowstorm! The Fairview Lawn Cemetery is the final resting spot for 121 Titantic victims. The black headstones are configured in the shape of a ship. The Museum of Natural History presents exhibits about marine life, geology, fossils, minerals, dinosaurs, birds, and mushrooms. The archaeology display includes examples of intricate, colorful porcupine quill work on birch bark. Alexander Keith’s Nova Scotia Brewery claims to be North America’s oldest operating brewery. 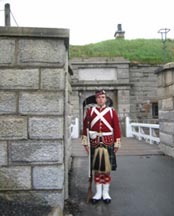 The 22-year-old Scotsman Keith arrived in Halifax in 1795 with brewmaster credentials. He bought and renamed the brewery in 1820 which had a ready market as the soldiers were allotted a gallon of beer a day. Pier 21, located on the southern end of the Harbour Walk, was the entry point to Canada for a million people from 1928-1971 and is now a National Historic Site of Canada. 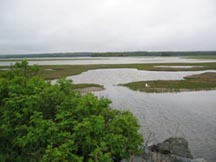 The Salt Marsh Trail, making use of abandoned railway, is approximately 6.5 km in Cole Harbour. If you look at a map, it appears that the trail traverses the water.